"Thank goodness I can still sprawl freely." Does your kitty remember a time when stitches were a pesky nuisance getting caught on her fur, fabric and furniture while poking her sensitive skin? Lucky for both you and her, these days are long gone. Dissolvable stitches are now widely used in many routine surgical procedures. Dissolving or absorbable sutures are generally used internally, beneath the skin's surface, so your cat won't see or feel them at all. As an owner, you don't need to fret over your kitty tugging, pulling or ripping them out before her wound has properly healed. As you check her incision after surgery, you may be able to see a few lumps and bumps, though in most cases the sutures are entirely hidden. The visible incision will be closed with medical-grade glue. Kitties are notorious for licking. Though she has no visible stitches, your cat might still paw or lick at her incision. This, as well as any other moisture, can cause the delicate incision area to become infected. She may need to wear a protective cone or collar for seven to 10 days post surgery. Protective collar or not, her activity should be restricted for at least a few days to allow for proper healing. This means no chasing squirrels or climbing trees outside. She will, however, have the luxury of sprawling on her favorite chair without fear of stitches snagging on the upholstery. 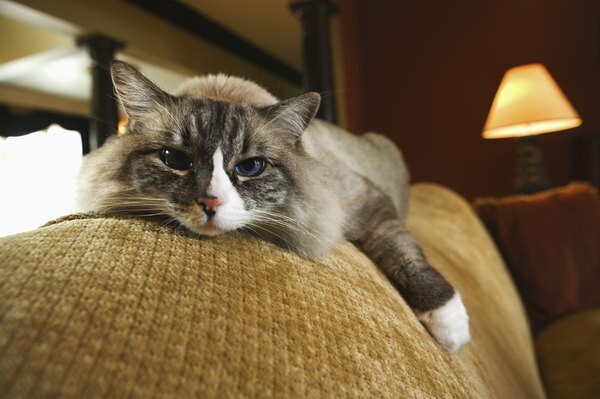 Monitoring your cat's behavior after receiving internal sutures is extremely important. Because dissolvable sutures are so well hidden, it's easy to forget your cat just underwent surgery. Any behavioral changes such as extreme lethargy or refusing to eat and/or physical changes around the incision such as increasing redness, yellow or green discharge, or a foul odor may indicate infection and warrant veterinary care. Dissolvable stitches don't dissolve into thin air as their name may suggest. Depending on the amount of stitches and their location, they're either absorbed internally or work their way to the surface and fall out between 2 weeks to several months post-op. Don't panic if you happen to spy a suture poking through your kitty's incision. This is a natural part of the healing process and means that the wound is nearly healed. The sutures have effectively done their job. What Are the Whiskers on the Top of a Cat's Head?